i have, as of this morning 60 gb of new songs on my hard drive and a box of 500 7"s sitting at my feet. i've listened to none of it. i may have reached a point where i simply have too much music. 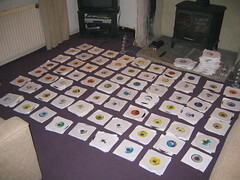 i haven't, but yer know, where do you start?- one 7" a day (vocal plus dub) gives me 18 months listening alone. there again, it may give this blog a focus. or should that be purpose?